Luke Hemsworth (born 5 November 1981) is an Australian actor who is known for his roles as Nathan Tyson in the TV series Neighbours and as Ashley Stubbs in the HBO sci-fi series Westworld. His younger brothers, Liam Hemsworth and Chris Hemsworth, are also actors. Hemsworth is the son of Leonie Hemsworth, an English teacher, and Craig Hemsworth, a social-services councillor. He is the older brother of actors Chris and Liam Hemsworth. His maternal grandfather is a Dutch immigrant, and his other ancestry is English, Irish, Scottish, and German. He has been married to Samantha Hemsworth since 2007, and they have three children together: Ella, Holly and Harper Rose. 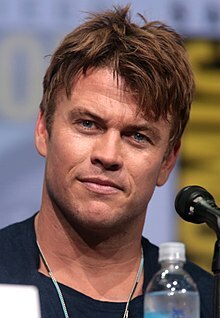 Luke Hemsworth (born 5 November 1981) is an Australian actor who is known for his roles as Nathan Tyson in the TV series Neighbours and as Ashley Stubbs in the HBO sci-fi series Westworld. His younger brothers, Liam Hemsworth and Chris Hemsworth, are also actors. Hemsworth is the son of Leonie Hemsworth, an English teacher, and Craig Hemsworth, a social-services councillor. He is the older brother of actors Chris and Liam Hemsworth. His maternal grandfather is a Dutch immigrant, and his other ancestry is English, Irish, Scottish, and German. He has been married to Samantha Hemsworth since 2007, and they have three children together: Ella, Holly and Harper Rose. Hemsworth trained in acting at the National Institute of Dramatic Art. He started his career on the Australian soap opera Neighbours as Nathan Tyson. Mainly a television actor, Hemsworth has appeared in TV series such as The Saddle Club, Blue Heelers, Last Man Standing, All Saints, and Satisfaction. In 2012, he starred in the 6-part miniseries Bikie Wars: Brothers in Arms as Gregory "Shadow" Campbell. He is set to star in the upcoming Australian war film The 34th Battalion as Robinson. He currently stars in HBO's Westworld as security officer Ashley Stubbs. 2003 The Saddle Club Simon Episode: "Foster Horse: Part 1"
All Saints Ben Simpson Episode: "Out of Darkness"
2007 Satisfaction Paul the Butcher Episode: "Lauren Rising"
The Elephant Princess Uncle Harry Episode: "The Big Gig"
2009 Carla Cametti PD Electrician Episode: "Love, Honour and Cherish"
2011 The Bazura Project Villain Episode: "Money"
↑ "Cyrus 'saw in new year on Phillip Island'". Herald Sun. Australia. 4 January 2010. Archived from the original on 14 June 2011. Retrieved 27 February 2010. ↑ Rapkin, Mickey (March 2012). "The Hunger Games' Liam Hemsworth Has No Idea What's About to Hit Him". Details. Retrieved 22 October 2012. ↑ "10 Fun Facts About Liam Hemsworth | People Magazine". 1 2 "Let's get ripped together! Chris Hemsworth keeps brother Luke's Hollywood dreams alive by hiring him on set as a personal trainer". Daily Mail. 2016-12-02. Wikimedia Commons has media related to Luke Hemsworth.